(PhysOrg.com) -- Mexican astronomers Hector Javier Durand Manterola, Maria de la Paz Ramos Lara, and Guadalupe Cordero working out of National Autonomous University of Mexico in Mexico City, have uploaded a paper onto the prepress server arXiv, suggesting that objects Mexican astronomer José Bonilla recorded in 1883 passing in front of the sun and surrounded by a hazy mist, were in fact fragments of a comet as it came apart very near the earth. Binilla wrote down his observations at the time and took some photographs of what he saw, but never really tried to explain what the objects were. Three years later the French astronomy journal L'Astronomie published the photos but deemed them likely high flying birds or bugs on the camera lens. 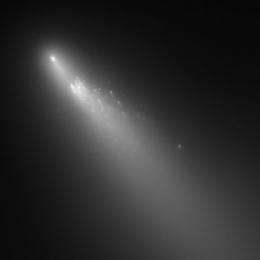 Now Manterola and his colleagues suggest that there is sufficient evidence to at least consider the possibility that the objects Bonilla saw were comet fragments. First of all they say, Bonilla wrote down everything about the sighting; where in the sky the objects appeared, how many fragments he counted (447) over the two days that he could see them, the type of camera he used and the photography techniques, etc. And perhaps most importantly, the time it took for a single fragment to cross the sun, because its that number that allowed the modern researchers to calculate their distance from Earth, which they suggest would have been somewhere near just 8000 kilometers. Also, because of Bonillas precision in recording the events, it seems doubtful that he would have overlooked bugs on his lens, or the possibility of the objects being birds, etc. The unfortunate thing in all this is that no one else reported seeing the objects that Bonilla saw, and there was no associated meteor shower as would be expected if a comet fell apart so close to Earth. Manterola and his team say that this could be because of the parallax effect, which happens when an object is so close, only those closest to it can see it. They also note that because of the apparent position of the objects, they would have been observable only from areas in roughly the same latitude, which would have included parts of Africa and Northern India and south-east Asia; places where no one was looking at the sun through a telescope. Others clearly are skeptical, for obvious reasons. But that may or may not matter because if the objects were in fact comet fragments, it appears we came pretty close to being wiped out. The researchers suggest that many of the fragments would have been on the order of the size of the one that struck Siberia back in 1908, destroying everything for miles around. If wed been hit with hundreds or thousands of such fragments at the same time, it might have knocked the life out of our planet, literally. In 1883, on the 12th and 13th of August, Mexican astronomer Jose A. y Bonilla observed several objects passing in front of the solar disk. In 1886 in the L'Astronomie magazine, he reported his observations without providing a hypothesis explaining the registered phenomena. Our objective in this work is to interpret, with current knowledge, what he observed in Zacatecas. Our working hypothesis is that what Bonilla observed in 1883 was a highly fragmented comet, in an approach almost flush to the Earth's surface. The fragmentation of the comet's nucleus is a phenomenon known since the XIX century. Using the results reported by Bonilla, we can estimate the distance at which the objects approach to the Earth's surface, their size, their mass and total mass of the comet before fragmentation. According to our calculations, the distance at which the objects passed over the Earth's surface, was between 538 km and 8,062 km, the width of the objects was between 46 m and 795 m and its length between 68 m and 1,022 m, the object's mass was between 5.58e8 kg and 2.5e12 kg. Finally, the mass of the original comet, before fragmentation, was between 1.83e12 and 8.19e15 kg, i.e., between 2e-3 and 8.19 times the mass of Halley Comet. I wonder how many other near misses we are unaware off? Also its sobering to think that we may be hit by multiple objects in the future not just one big object. We could say the very same about every research of historical events. But without studying the history we couldn't predict the future. Historia, magistra vitae. In particular, the path of potentially dangerous asteroids and comets is established just with studying of their former path. This comet will return to Earth in 2024 and it would be quite good to know, whether the same event cannot repeat again. If a comet came that close to Earth before disintegrating, surely some of its fragments should have been captured by the Earth gravity? The article itself points out there were no meteor showers observed at the time which makes this explanation a bit suspect. And it couldn't be simply travelling too fast for that since it wouldn't be in a comet-type orbit then (i.e. not a comet again). Comets can travel at over 21km/sec if they have highly elliptical orbits. I didn't see any estimates on its actual orbit. Just because it came close, doesn't mean any fragments would be captured or even have any likelihood of being captured. Again, it depends on the orbit. - Anything with a low albedo is less likely to be detected. We're still pretty blind to all the stuff that is flying around out there. I'm still stunned as to why we spend so much money on trying to snuff each other out (and protecting ourselves from same) when the real, planet-wide, dangers lie out there. It's like an elective (and collective) blindness to 99.999999999% of reality. Wow, hard to believe my post referring to the Bonilla sighting as an alien artifact was removed by the editors. I was attempting to be humorous and don't actually believe it was an alien craft. However, numerous people have legitimately advanced the theory that Bonilla did indeed see a UFO. In fact, the study quoted here was intended to refute the UFO theory as well as other similar ideas. Frankly, we just really don't know and likely never will. Nonetheless, the decision to remove my comment was ill considered. You are right on the mark. Defense budgets around the world have never been higher. But 99% of it is aimed at earthbound dangers, while the real species-level extinction dangers are largely ignored.